It wasn’t so long ago that one had to search through many books to find a photo of a Crested Gecko (Correlophus ciliatus), and seeing a live individual in a zoo was impossible. In fact, the species was presumed extinct in the early 1990’s! 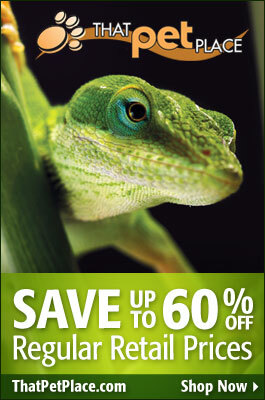 Today, these bizarre New Caledonian natives are captive bred in huge numbers, and are popular with reptile keepers worldwide. However, while their husbandry needs are well-understood, and rather easy to meet, substrate choice can be problematic. Judging by questions I’ve received lately and feedback from my zookeeper colleagues, intestinal blockages (“impactions”) caused by substrate ingestion are an important concern. Coconut husk, the most commonly recommended Crested Gecko substrate, has a down side. I’ve had great success using this product at home and in zoo exhibits housing tarantulas, centipedes, millipedes, land crabs, beetles and other invertebrates. 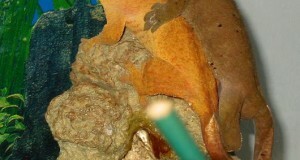 However, it is commonly swallowed by reptiles and amphibians during the course of feeding – more often, it seems, than occurs with other substrates. Coconut husk has been implicated in most of the Crested Gecko impactions I’ve recently been informed of. As is the case for other sometimes troublesome substrates, many keepers use coconut husk for Crested Geckos without incident. How do we explain this? Through discussions with veterinarian colleagues at the Bronx Zoo, I’ve learned that there are many variables which affect the passage of foreign materials through the body. The nature of the diet (and, of course, the swallowed material), hydration levels, calcium intake (calcium assists in muscle contractions, which may be needed to expel ingested substrate), general health and vigor and many other factors are involved. It seems best to err on the side of caution. I favor a mix of topsoil and sphagnum moss as a substrate for Crested Geckos and for many other species as well. Perhaps because of the size or consistency of the moss strands, sphagnum seems rarely to be ingested. I’ve successfully kept a great many amphibians and some reptiles on sphagnum moss alone. Moss that is taken into the mouth is, in the incidents I’ve observed, easily expelled. Soil seems like it “should be” troublesome, but that has not been my experience…I hope to look into the reasons for this in the future. I use soil collected from wooded, pesticide free areas, but you can also purchase bagged “organic” or “chemical-free” soil. Be sure to avoid products that contain white Styrofoam-like spacing material. By using roughly 2 parts soil to 1 part sphagnum moss, you can achieve a mix that holds moisture well and does not easily become compacted. This also serves as an ideal planting medium for many live plants…and Crested Geckos truly come into their own in complex, well-planted terrariums. I often establish colonies of sowbugs, millipedes, springtails and other leaf-litter invertebrates in terrariums with moist substrates; earthworms can also be used if temperatures are not too high. In addition to aerating the soil and consuming feces, dead leaves, and shed skin, sowbugs and others make healthful additions to the diets of many herps. Zoo Med Hydroballs, preferably but not necessarily covered by a layer of plastic screening, should be used as the base layer of your Crested Gecko terrarium. They are a bit more effective than the broken clay flower pots favored by us dinosaurs in assisting with drainage, preventing soil impaction, and maintaining high humidity levels. Those seeking an extra measure of safety may wish to consider terrarium liners. Potted plants camouflaged with rocks or sphagnum moss can be used to create a naturalistic effect. I’ll address the specifics of Crested Gecko care and breeding in the future; until then, please post any questions or observations below. Next: CITES Listing Sought for Snapping Turtles, 3 Softshells: Do You Agree? Thanks for writing this entry! It’s a very important topic when it comes to Crested Gecko care and constantly debated. I have a crested gecko on paper substrate with a chronic on and off sticking problem which I suspect comes from low humidity. It is a three and a half year old male with excellent body condition, good apetite and normal behaivior. He lives in a vertically oriented terrarium with bamboo sticks, fake plants and a cut coconut for a hiding place. There is a bowl which is filled rarely with water, usually I use it to place feeder insects. I decided to abolish the water bowl completely save only for when I am away – he drinks from standing water – to avoid frequent cleaning. The top is screen and it gets water by misting, one when he wakes up and another before I go to sleep. In the morning I rarely mist, as he is asleep and doesn’t utilise the water. He drinks normally and he is normally hydrated. That is not the problem. The problem is most probably from incomplete shedding. The substrate is paper for easy and efficient cleaning. In the past I have used paper towels, but now I use braille paper, in thickness and properties between normal writing paper and cardboard. Durable yet flexible. I line the bottom with whole sheets, and then I cover the surface with cut small squares, so when one gets soiled, it is quickly replaced, and the ensemble is cleaned less frequently. I also use an uth for gentle heating, which is beneficial from my experience. The problem with the uth, the screen top and the paper is that the place is too drying. I have not measured the exact time which takes for the cage to dry, as it is dependent on ambient temperature and amount of water sprayed, but it is usually a couple of hours. As for the problem, I started noticing it five months after acquiring the gecko, which was a year old and a little then. I don’t remember all the times when he had a problem, but I can give you detailed observations from June 2014 onwards. In June, he was quite well, though before shedding had a sticking difficulty as usual, but now a little more severe. After shedding he was normal again. Untill early September, he was sticking well. Then I spotted him ready to shed, and sprayed water, but It seems it doesn’t help in the last moment, and for a reason had a terrible difficulty sticking afterwards. The problem stayed for aprox a month, or until the other shed. For the next two sheds he was getting gradually better, though vestiges of the problem remained. Immediately after the shed, he seemed completely normal, but when remaining motionless in the middle of the glass, slowly, very very slowly, but surely he was slipping down. Moreover I have observed a steady decline of sticking ability until the next shed. I have put him in the so called gecko sauna of paper towels and warm water, I have put him to walk on cement walls, I have scrubbed the digits with cotton, nothing works. The only thing I can do is to check if all his digits exist, and hope for improvement in the next shed. I want to remedy this problem. Although it isn’t life threatening, surely it compromises the quality of life and moreover I cannot stand to see him like that. I want to construct a humid hide, which will have humid soil all day long. The idea is taken from the breeder Anthony Caponetto, who had noticed problems with dry air as well. What soil mix should I put? I plan on putting three fifths soil, one sand and one peat or compost. 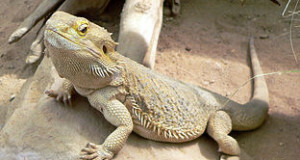 I would like to have a mineral alkaline mix with calcium in it, so if he licks substrate and swallows a small quantity would get calcium, as many reptiles do in the wild, but I don’t know what ingredients to mix. Help is needed as soon as possible. Thank you very much for the time, and wish you a happy new year! Ps. Could you give me some information about impactions in crested geckos? I have heard of it, but only as a theoretical concern. 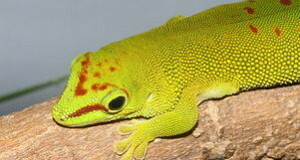 I have never read of a case of impaction in tropical geckos. I thought that only chronically dehydrated animals like unfortunately many leopard geckos and bearded dragons in captivity get impactions regularly. It’s generally a good idea to provide a water bowl for those lizards that will use it…their needs will vary over time, and it may be difficult to take in enough via spraying alone. A humidifier and hygrometer may be useful as well. Heat pads/UTH do lower humidity quite quickly…a ceramic heater or red bulb may have less of an effect. I use sphagnum moss to create humid hides for a wide variety of species; works very well. Impactions can be related to dehydration, but tropical geckos, well-hydrated individuals and aquatic herps of all species may be afflicted, Calcium stores (affects ability to contract muscles, expel waste), substrate ingestion, diet (i.e. high in mealworms, for some species) and general health can also play a role. Re substrate ingestion, impactions can occur even when animals are kept on the same substrates they encounter in the wild…more work needed in this area. Thank you very much for the help. From previous trials, I have filled my water bowl with no improvement. I will fill it again and put a humid hide to see if it helps. When you say sphagnum moss, you mean the moss or the peat? Will it develop mold? Will it mess the whole terrarium? I was thinking of the water bowl more as a drinking source than to raise humidity…it can do this also, but gen you’d need to cover some of the screen top with plastic, which also cuts down on ventilation. Is the moss sold living or dead? Doesn’t it need light to survive? Forgot to make you another question about the heating. My gecko usually sleeps at the ground in a coconut hide. A heat lamp that heats the top of the cage won’t have any effect. Also, what do you suggest for a container for a humid hide? I will go with the humid hide. Otherwise I would need quite a strong and hot lamp to heat satisfactorily under the hiding place, plus expensive equipment. ps. I haven’t found any care articles about crested geckos in your blog. If there is not, I thing it is time to write one. Many other readers might wait for it. You will certainly know more obscure but important facts and care advice about the species, plus you can find much more easily natural history studies which we cannot axess. In general new caledonian geckos aren’t covered much here.